All transactions are safe and secure with a reliable history in online purchasing behind each of our associates. Buy the Italian Stallion Rocky Shirt to own Rocky clothing and merchandise. Grab your music player and crank up the Rocky 4 soundtrack. It's time to workout! There's no better way to hit the gym than in one of these Italian Stallion Rocky t-shirts, available in multiple sizes. 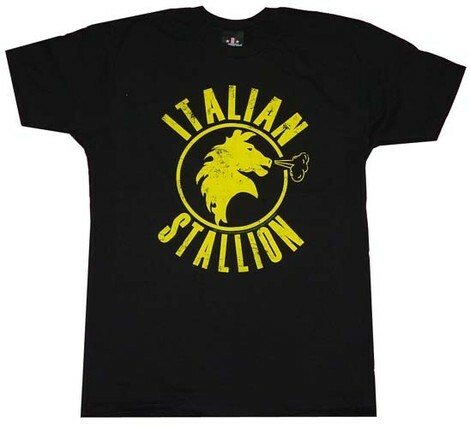 The tee is black with yellow print and it features a snorting Stallion, much like Balboa himself. It is a great gift for the Italian member of your family. In addition to the Italian Stallion Rocky Shirt above, browse the Rocky Clothing Gallery for more apparel like men's and women's clothes, kids shirts or hoodies.